Spike Lee’s 1988 college comedy School Daze is celebrating its 30th anniversary this year. The film is inspired by Lee’s own college experiences in Atlanta, Georgia, and unfolds over the hectic homecoming weekend at the historically black Mission College. The story focuses on the rivalries between Vaughn “Dap” Dunlap (Laurence Fishburne), a young activist who leads anti-apartheid demonstrations on campus and is frustrated by the reluctance of the administration to speak out against South Africa, and Julian Eaves (Giancarlo Esposito), who is better known as “Dean Big Brother Almighty” of the Gamma Phi Gamma Fraternity. Much of the conflicts on campus come from the divide between the darker-skinned students, who are called derogatory racial slurs, and the lighter-skinned Gamma students who are dubbed “wannabes,” with some of the sorority girls straightening their hair to appear less black and even wearing contact lenses, causing them to clash with the other women. Caught in the middle is Dap’s younger cousin Half-Pint (Lee), a naive and eager to please student who is desperate to join Gamma Phi Gamma, even if it means humiliating himself in the process. Released right in between She’s Gotta Have It in 1987 and his iconic classic Do the Right Thing in 1989, School Daze isn’t quite as celebrated as some of Lee’s other films, and it is somewhat of a minor entry into his filmography. The film has a shaggy and loose quality to it that keeps it from having more of an impact, and it’s marked by sharp tonal shifts that make it feel a bit unfocused, with Lee exploring a variety of different styles, including several musical numbers and an ending that doesn’t quite land. But School Daze is still packed with Lee’s signature social commentary, offering a pointed and often entertaining treatise on racial relations that was very of the moment in the late ’80s and is still relevant to this day. It’s delivered under the guise of a college comedy, and the film features strong performances from its ensemble cast, with Fishburne in particular doing standout work, and Lee really shining in his memorable supporting role. This is at the very least an interesting early film from a director who has continued to deliver relevant work, right up to this year’s BlacKkKlansman. The Blu-ray also includes a new 30th anniversary Q&A with Lee and members of the cast and crew, a commentary track with the director and another one with the cast, as well as the three featurettes Birth of a Nation, College Daze and Making a Mark, and a trio of music videos. 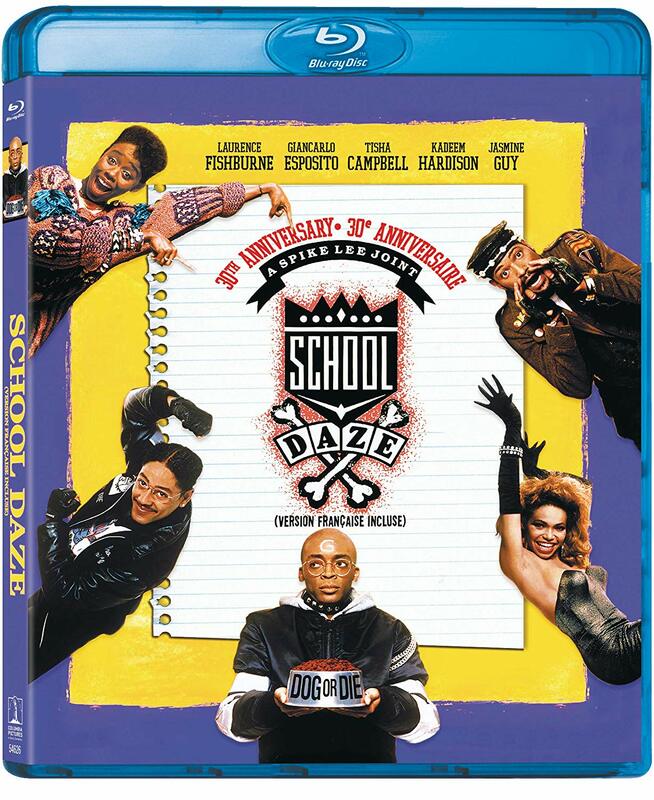 School Daze: 30th Anniversary Edition is a Sony Pictures Home Entertainment release. It’s 120 minutes and rated 18A.